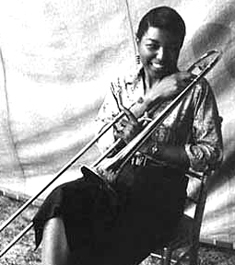 Melba Liston was a trombone player who was nothing less than a force of nature. In addition to being sought after for her second-to-none slide playing, she became widely revered for her jazz arrangements and compositions. She is, without question, one of the unsung heroes of the jazz genre. She was born in Kansas City, MO on January 13, 1926. When she was seven years old, Melba selected the trombone as her instrument of choice as part of her elementary school’s new music program. She later reflected that as a little girl, she chose the trombone because she thought it was the most beautiful thing she had ever seen. As a youngster learning to play the slide, she quickly learned how difficult playing the trombone was but she stuck with it. Only a year later, she was good enough to play a solo on a local radio station. In 1937, her family moved to Los Angeles and Melba’s mother matched her with a music teacher named Alma Hightower. Melba studied with Hightower for a few years but by the time Melba reached the age of sixteen, she decided to become a professional musician and joined the musicians union. She became a member of the band of the Los Angeles Lincoln Theater. During her period with the Lincoln Theater band, she interfaced with the International Sweethearts of Rhythm and also began composing and arranging for other acts performing at Lincoln Theater. This spirit of musical entrepreneurship and creativity would carry Melba throughout her illustrious career as a trombone player, composer and arranger (roles rarely given or attributed to women in jazz during this era). After her stint at the Lincoln Theater, she joined a band newly-formed by trumpeter Gerald Wilson and also recorded with Dexter Gordon. 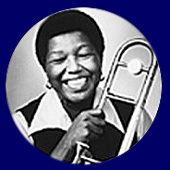 Melba stayed with Wilson’s band through 1948 when the band broke up. She then joined Dizzy Gillespie’s big band which, at the time, included musicians such as John Coltrane and John Lewis. Melba enjoyed working in this exciting band full of talented artists but Gillespie disbanded the group only a year later. She (and her former bandleader Gerald Wilson) then joined a band backing Billie Holiday on tour. The experience of touring throughout the south with Holiday’s band, coping with the strains of limited income and even more limited audiences, was strenuous, disheartening and exhausting for Melba. In later years, Melba spoke candidly about the extreme difficulties of being a female jazz musician during this era. More than being shunned or overlooked, she, and likely many other women musicians trying to make their way, were abused. However, despite consistent abuse by male musicians, Melba found strength and motivation in her music. She later left Billie Holiday’s band, stopped playing the trombone and moved back to Los Angeles where she worked in a clerical position in the city’s Board of Education. She stopped playing the slide but her creativity and love of music prevented her from abandoning arranging and composing altogether. Melba quickly became known and respected in music as a savvy and remarkable bebop jazz arranger. Her later work would demonstrate her stellar ability to transcend categories and embrace post-bop, Afrobeat and Motown sounds in her compositions. During the 1950’s, Melba tried her hand at small roles in film, including bit background parts in The Prodigal and the Ten Commandments. However, in 1956, she returned to playing her trombone in Dizzy Gillespie’s orchestra commissioned by the U.S. State Department as a musical ambassador of the U.S. in South America. She wrote and arranged many of her most memorable tunes during her work with Dizzy’s ambassador orchestra including “Stella By Starlight,” “My Reverie,” and “The Gypsy.” She later transitioned into working with Quincy Jones (a fellow alum of Dizzy Gillespie’s band) and his orchestra as both a player and writer until that group fell on difficult financial times. In 1958, Melba Liston recorded her only album as a leader, Melba Liston and Her ‘Bones – a true gem in jazz history. She later settled in New York and worked as a freelance arranger and composer for studio sessions of various artists including Marvin Gaye, Milt Jackson, Randy Weston, Gloria Lynne and the Supremes. During the 1960’s is when Melba’s best collaborative relationship – partnering with Randy Weston – flourished. Randy Weston simply adored her expert musical abilities and they worked together on a number of projects for many years to come. In fact, their collaborations produced several notable albums including the critically acclaimed albums Uhuru Afrika (1960) and Highlife (1963). I would venture to say that Melba was a pioneer in the explicit melding of contemporary African rhythms and intonations with American jazz. I am sure Fela Kuti took a listen to these albums on occasion. During the 1970’s, Melba Liston spent six years in Jamaica on a music education appointment at the University of Jamaica and served as director of popular music studies at the Jamaica Institute of Music. When she returned to the US, she formed an all-female jazz band called the Melba Liston Company which headlined at the Kansas City Women’s Jazz Festival. The band was discontinued in 1983. Melba continued to be actively involved in the jazz scene as an arranger and composer including critically acclaimed projects with Randy Weston through the 1990’s. Unfortunately, her health declined with the first of several strokes in 1986. Melba Liston passed away in 1999 but left a phenomenal legacy as a jazz trailblazer.